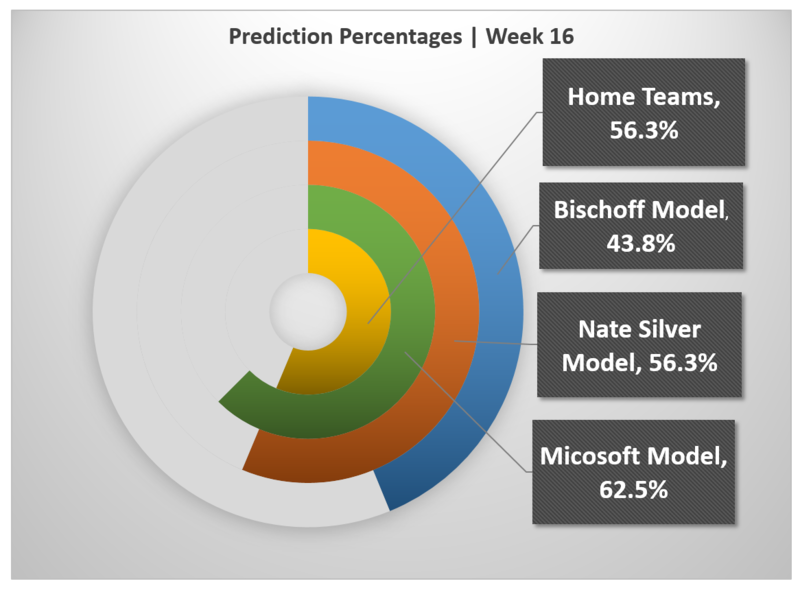 The Bischoff model came out of Week 16 with its worst week of predictions since Week 2, predicting just 7 out of 16 games (43.8%), nearly half from the previous week where it predicted 13 out of 16 games (81.3%). Nonetheless, the Bischoff model still has continued to keep up with its peers. 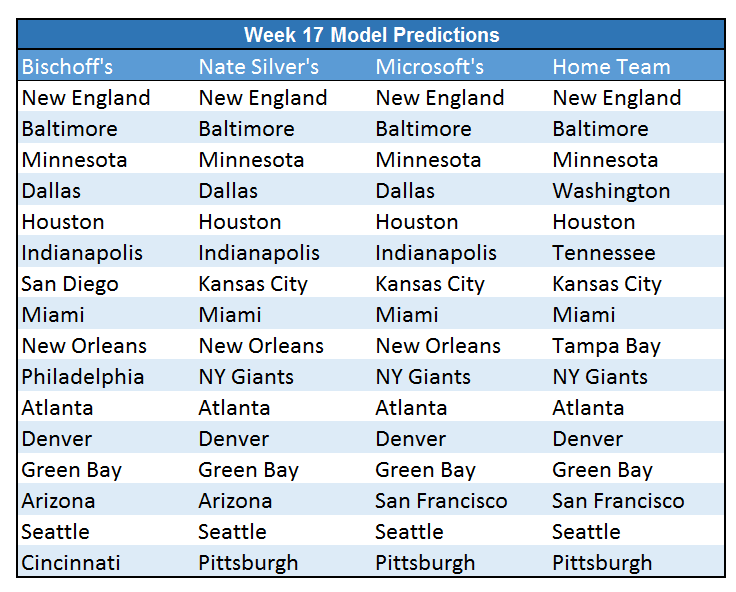 Nate Silver’s Elo came out with 9 correct and Microsoft’s Cortana, on top, boasted 10 correct predictions. Marking only the 2nd week that Microsoft out predicted both models. 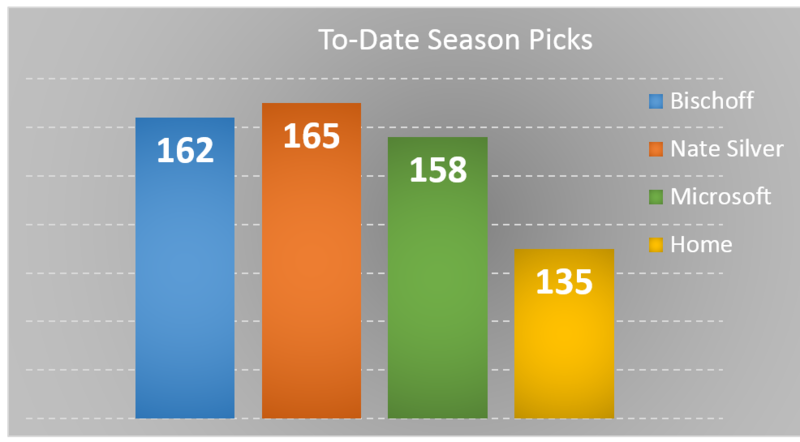 Getting an overall look leading into the final week, Elo leads the pack with the Bischoff model following by 3 games while Cortana lags behind. However, given the predictions for this Sunday, the Bischoff model poses a threat to tie Elo. 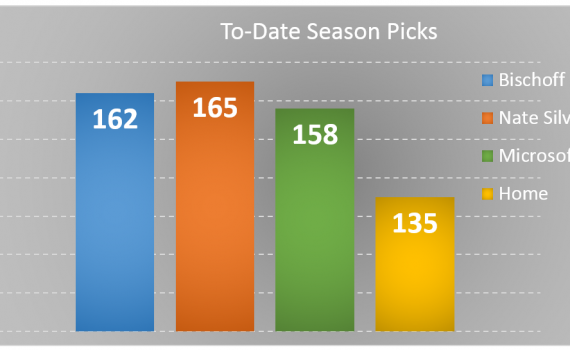 Bischoff and Elo disagree on 3 games which allows a variety of outcome possibilities to finish the 2014 regular season. Cortana only disagrees with Elo on 1 game, which Bischoff also agrees with Elo on. Below are the full predictions. Hola! I’ve been reading your blog for a long time now and finally got the bravery to go ahead and give you a shout out from Houston Tx! Just wanted to mention keep up the good job!